I've been trying to clear off my sewing table to begin a new project. Which new project I haven't quite decided, but I hope to make that decision soon. One of the things that needed clearing off was Block 3 of my Cottage Sampler BOM from The Quilted B.
I love house blocks and was tickled when this one came! For the most part, the block is being made from Etchings by 3 Sisters for Moda. However, there are a few fabrics here and there from Bunny Hill's Lily and Will. In this block it would be the "fencing". I just love this particular fabric and can think of all kinds of excuses reasons to buy some more! Here are the first three blocks. They go together quickly, so I have a bit of a wait for Block 4! So tell me -- what you you working on right now? Great blocks! I love houses, too. 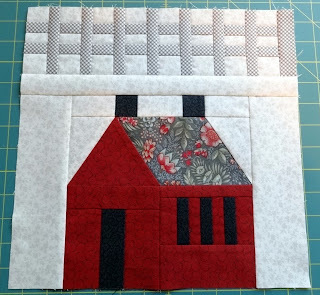 I'm working away on Farmer's Wife blocks these days. How fun. This is so cute Candace. I was so tempted to sign up for the BOM. I guess I'll just have to enjoy this quilt virtually while you put your blocks together. Adorable! The blocks are really great. I love that fence. I'm doing a BOM using FatCat Patterns Funky Chicken blocks. I'm also ready to square up a baby quilt and then sandwich it and quilt. I've got a few other tops that need some final touches, too. And I have a Bella Luna quilt from Lisa Moore that I started in her workshop well over a year ago and I want to work on it. Course, I'll have to relearn all the techniques she used, cause its been so long! Oh, well. Your blocks are lovely. Isn't it amazing how we can be so inspired by such differing subject? I am working on a baby quilt in yellow, green and taupe. It's rail fence and was very swift to put together. I like the house block even bettern than the lovely heart block. I'm working on a belated secret. Love these blocks, and your house is so cute. 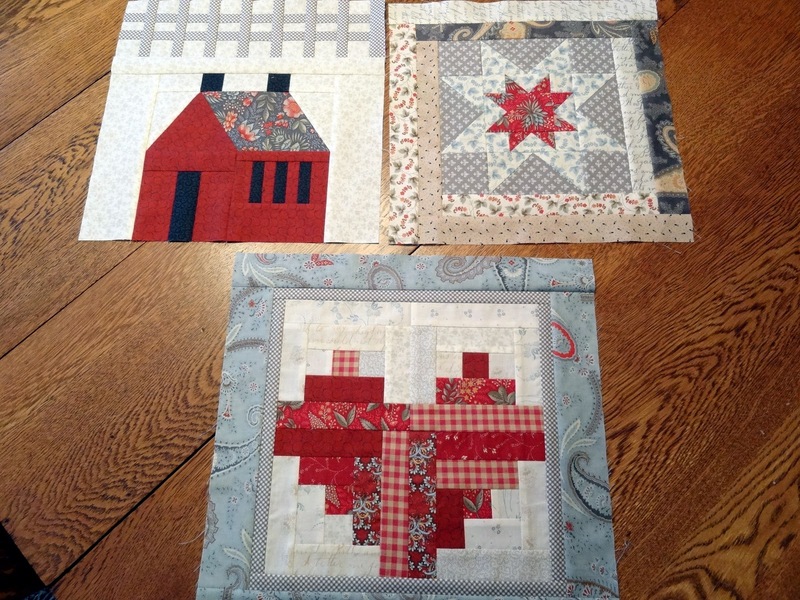 I have 4 piecing projects on the go right now, along with 2 hand quilting pieces and a BOM applique (I'm on block 17 of 25) This is the first time I"ve had so many active piecing projects, but it seems to work right now. Your sampler blocks are really cute! I saw the full quilt in person at one of the Puyallup shows. It's going to be beautiful! When you shared this last month I went to try an get it because I really like it....seeing todays block confirms that I LOVE it! BUMMER I missed out. I don't know what I am working on. Hopefully something I have already started! Very fun blocks! I am working on house blocks too in the Around the Block quilt. Though there is some house cleaning that needs to get done before my sewing time! These 3 blocks look great together! Good for you for keeping up with them. I always seem to get behind. I too love this fabric line and the prints look so wonderful in your blocks! I'm currently working on 2 Dear Janes, a redwork quilt and the JT2 sew-along. Nice mix of traditional block and modern colorway. Good going! The house block looks especially wonderful.